Hello Friends Baal Aadhaar Card is necessary for your child/Youngster when he/she visit first time in school for admission. Children’s who wanted to take admission in School or college than without Adhaar card no admission will be allotted to you in any 1 to 5, 6th to 12th Class. Mother Father Document should be ready. The Last Document is Birth certificate of your Child. Visit Nearest Adhaar Center for filling Baal Aadhaar Card Online Form. Make of Photocopy, Adhaar Card Photostate. Adhaar Card for Below 1 to 5 years Age Limit: Blue Baal Aadhaar Card is colored adhar card for children whose age limit is Below 5 years. No Biometric needed for above 1 year or below 5 years. 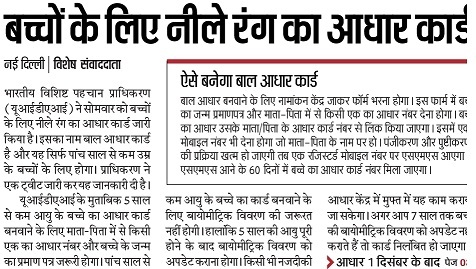 At the time of filling online form of Baal Aadhaar Card. Mother Father Adhaar Card linked ti his/her Children Adhaar card number. Baal Aadhaar Card Accepted Form: After Confirmation you will allotted photostate receipt. Confirmation Message of "Baal Aadhaar Card” is sent your email ID and Mobile Number. Within 60 days of time Baal Aadhaar Card Original sent by Post Office.